Check-in time is 3 PM and checkout time is 11 AM. Please be certain to plan your arrival and departures days accordingly. Earlier check-in and later check-out may be available if no other guests are scheduled to depart or arrive on those dates. This house works really well for a small family. Beds are nice and comfy, there is a lot of storage. Bathrooms are convenient and modern. Windows open to create a nice breeze through the house. Kitchen is top-notch. Lanai downstairs provides a great place to eat and dry out snorkeling and diving equipment. Lanai upstairs is fantastic for a sunset wine or cocktail. The view is great, including occasional whale or a pod of dolphins passing by. A nice pool is steps away. We did not have a chance to use boogie boards provided by the owner - waves were a bit too high during our stay, but beach chairs got quite a use. Location is great - right next to the shopping center and restaurants, 5 minutes to a great snorkeling place, and pretty much anything on a Kona side is a short drive away. We are definitely coming back. Expansive ocean and golf course view from upper lanai; partial ocean and golf course view from lower lanai. Sunset views from upper lanai year-round. Level entry, carpeted stairs to second floor where bedrooms are located. This townhome can be rented as a 2-Bedroom / 2.5-Bathroom Ocean view condo with Kitchen, Living Room, Master Bedroom, Second Bedroom & Two Lanais. Na Hale O Keauhou is one of my favorite complexes to stay when visiting my favorite Island. This unit was tastefully decorated (I am obsessed with the look of the 1/2 bath downstairs!) and tried (unsuccessfully) to find the octopus print hanging in the master bedroom. The kitchen was very well-equipped with cooking utensils, pots & pans, storage containers, etc. We arrived the day after Hurricane Hector passed by, so the humidity was extreme. We had opted out of the AC for our stay, but after the first night, we contacted the owners and had the AC turned on (90 degrees inside-yuck!) The portable fans in addition to the overhead fans just couldn't beat the heat for us. The unit is very quiet - not sure how many shared walls there are with the two adjacent townhomes, but we never heard a peep from the neighbors. A perfect location for exploring the Island from all directions. We stayed at J-2 for 9 days this May and absolutely loved it! The unit was stocked with everything we could have needed to make our vacation comfortable. It is perfect for two couples (like us) or a family.The kitchen was great and the lanai was very comfortable, we enjoyed many meals out there. We didn't use the snorkel gear since we had our own masks, but we made a good use of the beach chairs. The location was perfect for us, not far from Kona town and all the restaurants, but in the short driving distance to the best snorkeling spots on the island: Two-Steps and Captain Cook.The property owners were very easy to work with, it's a great place to stay to explore the Big Island.We would definitely stay here again.Thank you, Jane and Richard! We just spent in 9 days in the town-home belonging J-2 belonging to Jane and Richard.We are very experienced travelers , with the orientation on visiting tropical islands. This was our 34 island that we visited. We have experience to stay in hotels, bed and breakfast and rentals. We believe that staying in rentals and local bed and breakfast is the best way to learn about the place.By all means this was one of our best stays.:1. The location is just fantastic. Close to the city, beaches, groceries, restaurants and airport. It was also very easy to get to Volcano national park. It is also very safe neighborhood, there are several walking opportunities to go directly to the nice beaches from 15 to 30 min.2. The town-home is very comfortable, well supplied with kitchen utilities, has washer and drier.3. The owners are very responsive, polite - they even allowed us to check out later for free. I definitely will try to stay in this place during our next trip to the island. I also would recommend the place to other travelers. The place has one of the highest ratings on rental websites and our experience just confirmed it. My family and I recently stayed here for 8 nights while we were on the island for a soccer tournament in Kona. The condo was well appointed and fit our family of four perfectly. The kitchen was fully stocked with ample dishes, utensils, cookware, etc. We used the bbq on the lanai and prepared most of our meals. The bedrooms were comfortable and having the ensuite bathrooms were very convenient. It was really nice to have the sleeping area separate from the living space. The air conditioning worked really well and kept the upstairs nice and cool for sleeping. The unit itself was also very close to the pool which was great for our kids. The only downside was that the hot tub was for 12yrs and older which was a bummer as we had a ton of rain during our stay. The kids really wanted to warm up in the hot tub but couldn’t. Otherwise, our stay was wonderful despite some terrible weather. We would definitely come back! Visited the Big Island from Feb 4-13, 2018. My wife and I are in our mid 50's and look for a good quiet location to stay on our vacation. This unit fit the bill perfectly. I will list the good and bad points but will tell you now there is not many bad, really just minor points, with this unit. This is the type of information I look for and pass to others when searching for a condo rental. 1. Excellent location if you are looking for a quiet well equipped condo rental. Very close to the Keauhou Shopping Center where there is a large grocery store, drug store, medical clinics, shops and a number of restaurants with in a few minutes walk from the condo site. Also about a 10 min walk from Kahualuu Beach Park were there is excellent snorkeling (saw lots of fish) with parking, washrooms, change rooms and lifeguards on duty. About 15 min drive, depending on traffic, to Kailua Kona where there are ample restaurants, bars and shopping. About 30 min drive from Kona airport.2. Condo grounds are meticulously maintained and there is lots of parking next to the unit. Available in ground pool on the grounds. Didn't use it but it looked very well maintained and never crowded.3. Condo is a gated community so it was very quiet and safe. We left our 2nd story windows open almost all the time to keep the unit cool and never had any issues.4. Unit J-2 was very well equipped. Main floor has good size kitchen and living area and 1/2 bath. Second floor has two good size bedrooms with attached full bathrooms. Mattress in master bedroom was very comfortable. Lots of windows in the unit to allow that cool evening breeze in. Lots of bedding, towels. Washer/dryer(for those who travel light). Fully equipped kitchen with granite counter tops and stainless appliances, lots of dishes of all kinds. Excellent high speed internet/wifi, beach chairs/umbrella, snorkeling gear. The unit is tastefully decorated. Unit is relatively new so all condo buildings and unit J-2's interior/exterior don't look run down at all.5. Nice patio and balcony off main floor and master bedroom. with deck chairs and gas barbecue on ground level patio.6. Great view of the ocean from the 2nd floor balcony.7. Renting and payment installments where a breeze through Aloha Condos and Homes. Payment installments charged to credit card when indicated and never had any issues. Aloha Condos always informed buy e-mail when charge was made.8. Excellent instructions from the owners, Jane Schmitt & Richard Crack. They provided very clear instructions on how to find the condo complex, entry to the grounds and unit itself. No verbal contact was required and you did not have to meet anyone for access. Also very clear instructions on how to leave the unit on your last day. The Bad.......and these are picky and there aren't many. 1. If you are younger and like the night life in downtown Kona this isn't the location for you. It is about a 15 min drive, in good traffic, to Kona. So not close if you plan to stumble home from the bars.2. Unit deficiencies. We are tea drinkers and the kettle in the unit was unusable. Time for a new one. Toilet off master bath needs repairing. Constantly running. Dishwasher requires repair. Was leaking water with every wash. No cutting boards for food prep to be found in the unit. Time to buy some. Possible improvement. Patio/Balcony face west, in direct sun, and unbearably hot to sit out there in late afternoon to enjoy the view. Will Condo Association allow the installation of shades of some sort?3. Electricity is expensive in Hawaii so expect a surcharge if you want to use the available central A/C. The owners warn you in advance of booking of the added expense so there is no surprise when you book/stay. However, the condo is equipped with lots of ceiling fans there was usually a cool breeze off the ocean at night and we were very comfortable sleeping with the windows open on the second floor. Again the condo complex was very quiet and safe. We have visited O'ahu, Maui and the Big Island with the Big Island being our favorite so far. Also excellent stay at Na Hale O Keauhou, Townhome J-2. We plan to visit the Bit Island again in the future and would definitely rent unit J-2 again if available. We stayed in condo J2 for two weeks over the Christmas break. It is a superb location, with shops just up the hill (within walking distance) and the beach just down the hill. It is also only 10 minutes drive to the shops and restaurants on Alii Drive.The layout of the condos at Na Hale is very spacious and the grounds are immaculate. The share pool is great and a perfect way to cool off! The condo itself had everything we could possibly have needed including beach supplies etc. It is a great layout and beautifully furnished. We really enjoyed the sea view and stunning sunsets.I would definitely recommend it and will definitely be coming back! We are so pleased that you enjoyed our J2 at Na Hale o Keauhou. We are new owners and have made some decor improvements in the six months we’ve owned it and will continue to improve it with the addition of new wood like floors on the stairs and bedrooms. So, we hope you will return sometime and enjoy the condo again and all the surrounding area has to offer. Best place to stay in Kona!!! We really love this condo!! !Would go back in a minute, clean, cozy and quiet. Everything you are looking for when you are on vacation! When they say, "Big Island", they really mean BIG. 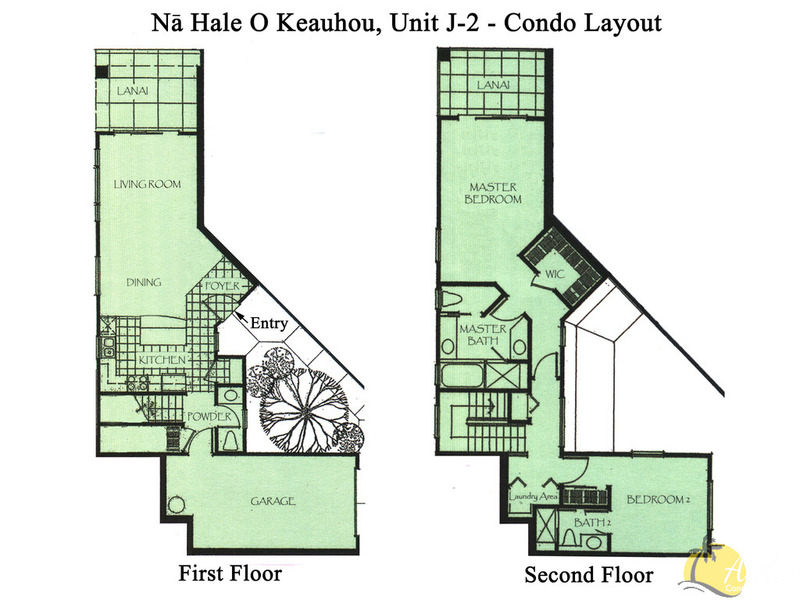 Na Hale O Keauhou, Townhome J-2 is a wonderfully huge home to rent. This townhome has everything one could need. It was so comfortable for our stay, we really did not have to go out in the evenings. The Gas BBQ Grill we used one evening and ate out on the Lanai adding to the experience. The set-up of the bedrooms are perfect so that they are separated allowing each guest to feel special in their own suite. The Kitchen is stocked with all necessary cooking supplies. We were quite satisfied and happy to have not to worry about our accommodations. Location is perfect, a few minutes off the main highway, 2 minute drive or 10 minute walk to a small shopping area with grocery store and drug store, few restaurants, art and craft shops, urgent care and even a movie theater. Then going the other way following Alii drive north directly into Kona Town only a 10 minute drive out the front gate to loads of restaurants and craft type shopping, plus historical sites, outdoor markets, etc. The owners were most upfront, quick to reply and cooperative with inquiries that we had. I definitely recommend Na Hale O Keauhou, Townhome J-2 for your stay. Nothing bad to say. Do it - you won't be disappointed. Just spent another 2 weeks here. Liked it so much the first time had to come back again. Especially like the location, close to the snorkel beach, which we did everyday, convenient to markets and a nice view. This whole complex is great. Although the weather wasn't very cooperative - we had 5 gray days - we had a lovely time and thoroughly enjoyed our stay in this condo. The owners really have provided everything to make the stay easy and comfortable. It is very well outfitted with everything you need in the kitchen, paper products, soaps, spices, etc so it's easy to walk in and feel right at home immediately. This is a place where people are allowed to leave behind condiments in the fridge, remaining sunscreen and other such things, so check in first and see what's there before you buy all of that en route. The linens are lovely and amply provided. There's a washer and dryer, which is very convenient. Beach towels, chairs, beach toys, coolers, coolpacks, and totes are there, great bonuses for travelers who can't bring all those things along. The home is well appointed and very well kept. We enjoyed both the upstairs and downstairs patios. Sunset (when the sun shines!) is gorgeous from upstairs. The hosts are very thoughtful in making this a great place to stay and we were delighted to find a generous welcome basket at the door with coffee, fruits, honey, and jam. There's a small shopping center very close by with a grocery store, drug store, urgent care and other shops and services so it's easy to find whatever you need without having to travel for it and a great farmer's market there on Saturday. We rent often when we travel and this is absolutely one of the best places we've rented. Very reasonable in price and great value for the money. We'll hope for another stay another year....Mahalo. We enjoyed two weeks in this perfect condo. Since we like to snorkel and swim everyday, it is a short drive to the snorkel beach(or a walk if you don't mind a small hill), plus convenient to a supermarket and top notch restaurant, again within walking distance. Also right next to the heated swimming pool. The condo is especially well stocked, very clean, good view of the ocean and cool enough that air conditioning was not necessary. We will give this condo our first consideration next time we come to Kona. From the moment we arrived we felt like we were at home. Bob's condo had everything we needed and more - from towels, a full kitchen to snorkelling gear and a beautiful view from the upper lanai. The complex is quiet and provides excellent amenities including a fitness centre, outdoor pool and hot tub. The great part about this place is the location. The supermarket is a two minute drive; snorkelling and a fun beach with great waves is just 5 minutes away. There are also some really good restaurants and shops to check out on Alii Drive. We thoroughly enjoyed our stay and wished we didn't spend the last part of our honeymoon at a resort because we had such an amazing time in Kona!! We definitely will be back and will recommend this place to others. Thank you for sharing your Big Island home with us! We cannot wait to return! This was my sixth trip to the Hawaiian Islands, and the fifth condo or house I have rented. I must say that this was the best condo/townhouse I have had the pleasure of staying in. The townhouse is comfortable, clean, plushly appointed, tastefully decorated, and very well equipped with virtually everything a family would need for a comfortable stay in Hawaii. The community is immaculately maintained with beautiful landscaping, has plenty of parking, and the pool is very nice. There's also a shopping center with a large supermarket and drug store near the community, so the convenience is an added plus if you need to make a quick run to the store. The unit has ocean views and the upstairs patio is great for your morning coffee. The place is quiet and you do not hear your neighbors which was important to me. The kitchen has everything a you need for cooking your meals. The beds are comfortable; the linens are soft, and the garage has coolers, beach chairs & umbrellas, and water sports gear for your trip to the beach. And the best of all, the place has central air conditioning (for a small fee), which for us is a must for a comfortable stay in August. Bob, the very responsive and considerate owner, even sent us a gift basket full of Hawaiian goodies from the local farmers market for our first morning. Thank you Bob! My family and I really enjoyed our stay in this beautiful townhouse and, we would definitely stay in this unit again. I give my highest recommendation. My family and I stayed in the property and couldn't have been happier. Upon arrival, the welcome basket was thoughtful and the trip only got better...The community was very nice and the people we encountered were all pleasant. The location was perfect within the community. It was near the grocery stores and many other activities on the Hilo side.The condo was beautiful and comfortable. It had everything. Even when we thought we forgot something, the owner had already thought of it. The condo was immaculate, the beds were comfortable and the bath/showers were great. If and when we travel back to Hawaii we would definitely stay there again. Beautiful, comfortable, clean and fairly updated condo with view of ocean, golf course and pool. Great location! Near market, beaches and movie theater. It was so nice to feel like home away from home. The condo has EVERYTHING!! AC, cable, Wifi, fully loaded kitchen , beach towels and toys, relaxing tub, washer and dryer, balcony and lanai with its own BBQ grill. The pool and spa area were awesome, so relaxing, had area to ourselves everyday. Gym is well equipped and pool area also had BBQ grill and kitchen to have meals by the pool. Owners thought of everything needed to make our vacation an amazing experience. Very safe in a gated community. I highly recommend it to a small family and if a larger group is traveling their are condos for rent right next door to make it a family reunion. This house works really well for a small family. Beds are nice and comfy, there is a lot of storage. Bathrooms are convenient and modern. Windows open to create a nice breeze through the house. Kitchen is top-notch. Lanai downstairs provides a great place to eat and dry out snorkeling and diving equipment. Lanai upstairs is fantastic for a sunset wine or cocktail. The view is great, including occasional whale or a pod of dolphins passing by. A nice pool is steps away. We did not have a chance to use boogie boards provided by the owner - waves were a bit too high during our stay, but beach chairs got quite a use. Location is great - right next to the shopping center and restaurants, 5 minutes to a great snorkeling place, and pretty much anything on a Kona side is a short drive away. My husband and I stayed in this townhouse for eleven nights in November 2015. The home is beautifully decorated in island style. The unit is located in a well-kept, quiet gated community. There is a pool and exercise room available and, of course, the beach is just minutes away. There are beach towels and ice chests available for those trips. The kitchen is equipped with everything you could possibly need. There are beautiful views from both lanais with the one off the master bedroom great for watching sunsets. This home would work well for two couples as both bedrooms have attached, private baths. While the location is south of Kona it is an easy trip on the upper highway and everything from groceries to restaurants are a short distance away.